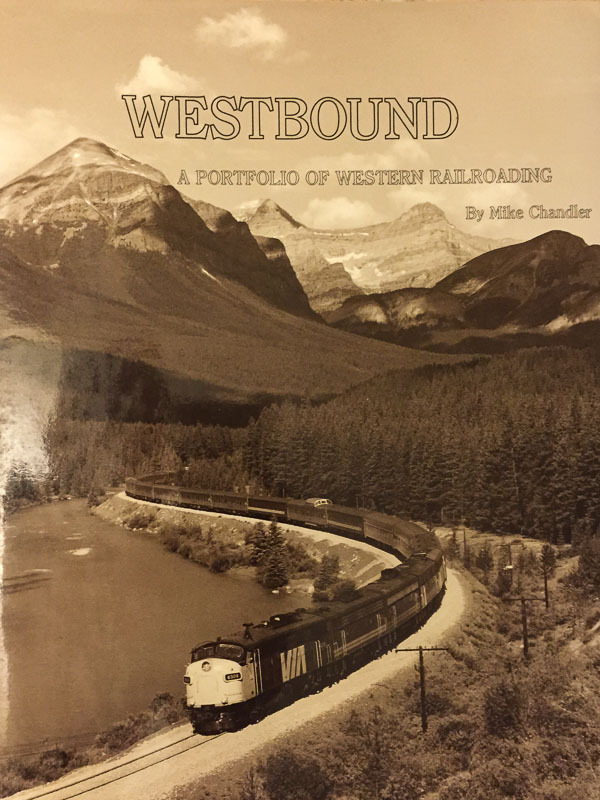 Review: Westbound: A Portfolio of Western Railroading by Mike Chandler. I stumbled across this book last week in a used book store. The cover grabbed my attention with VIA's train at Morant's Curve. I flipped through it briefly and bought it within minutes. As the author, Mike Chandler, says in the foreword, the book is "with minimal text". This is mostly a picture book. The pictures are excellent - lots of "behind the scenes" photos from the author's long career with CN. The majority of the photos were taken in Canada, but there are a few American photos as well. The photography is excellent and varied - from panoramic shots like the cover to close-up "Greg McDonnell" style photos (and I say that as a compliment). If I'm not mistaken, this Master Model Railroader is Mike Chandler. I highly recommend this book. Westbound: A Portfolio of Western Railroading (Amazon affiliate link). Note that you can buy the book directly from the publisher at: Bonaventure Press, 1101-720 Hamilton Street, New Westminster, B.C., Canada V3M 7A6.The purchase price of $39.95 is all inclusive.Thanks to the author for this information. 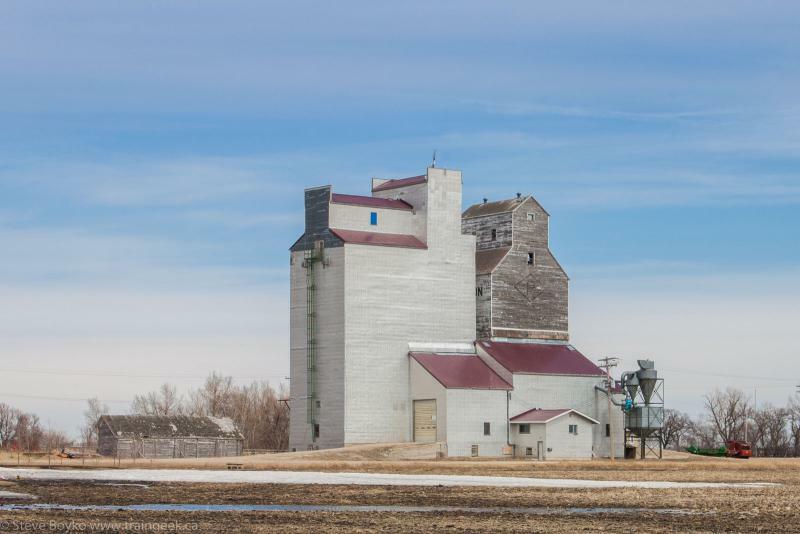 Come with me while I show you the grain elevators still standing on the Canadian Pacific (CP) Glenboro subdivision, from Winnipeg to Souris, Manitoba. First, let's talk about the Glenboro subdivision. The subdivision runs from Woodman, which is on the CP Carberry subdivision, 3.8 miles west of Rugby aka the yard. At mile 12.4 it crosses the CN Rivers subdivision at Diamond. 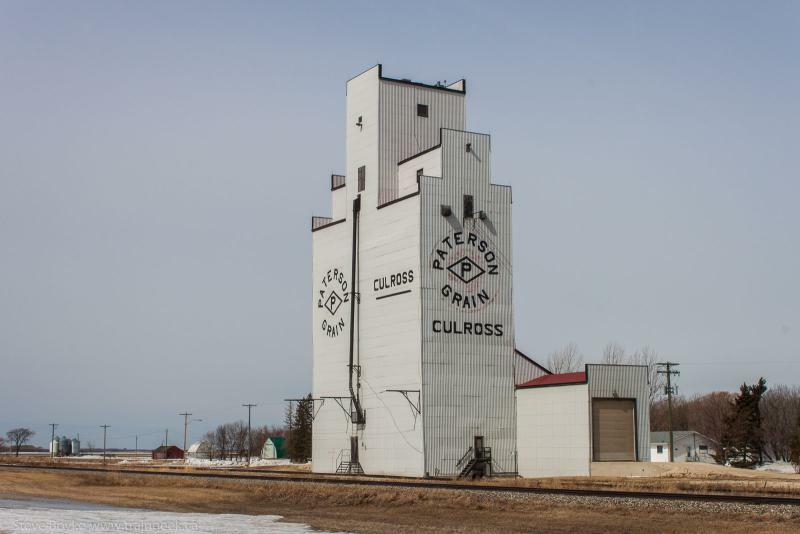 In A Grain Elevator Loop, Part 1 I discussed the first four stations, Starbuck, Fannystelle, Culross and Elm Creek. 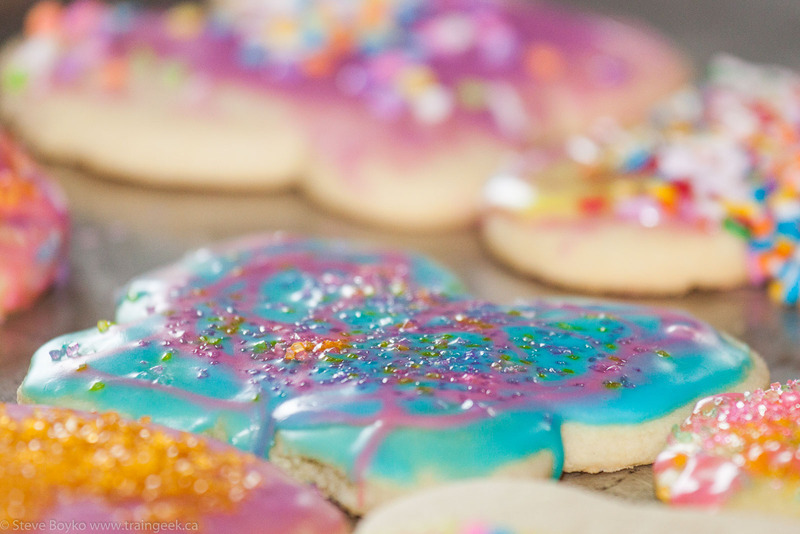 Here's some photos I didn't use the first time. There's no elevator at St. Claude, and I haven't found any mention of any former elevator there. One has to imagine there was one. Next is Rathwell. 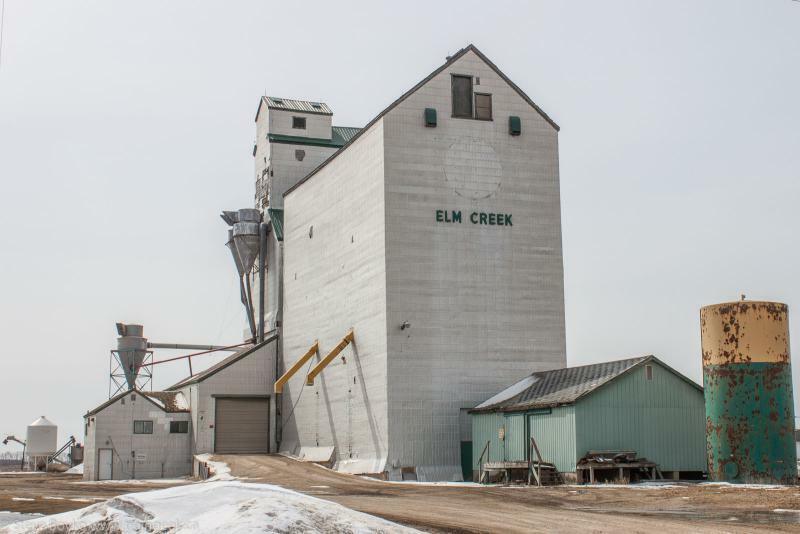 This town no longer has a grain elevator (in 1990 it still had 3!) 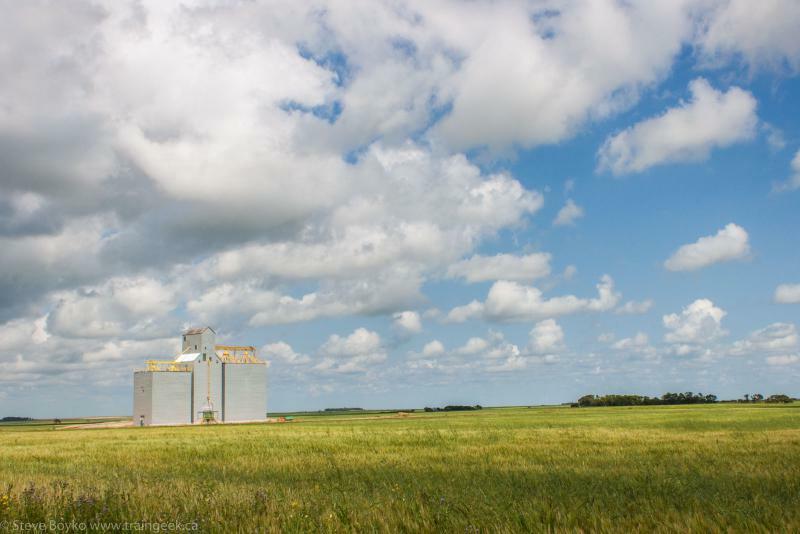 but it does have a grain facility. 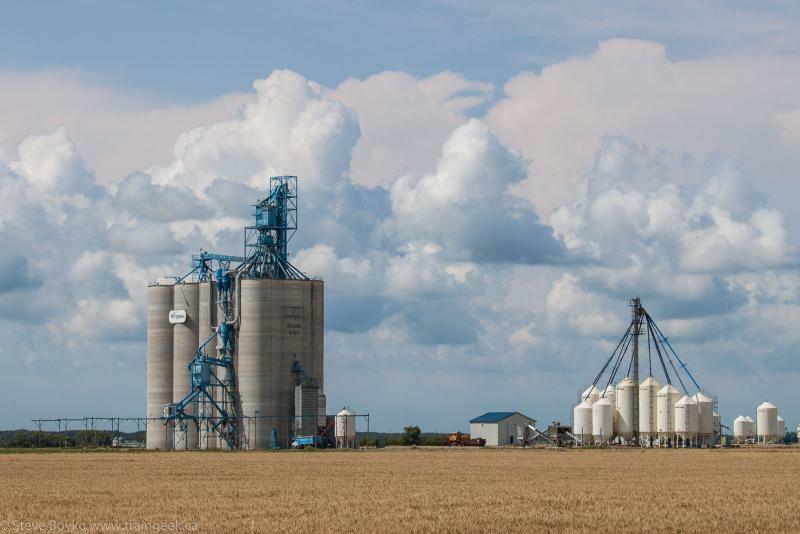 Louis Dreyfus has a 42,000 tonne facility just west of town. 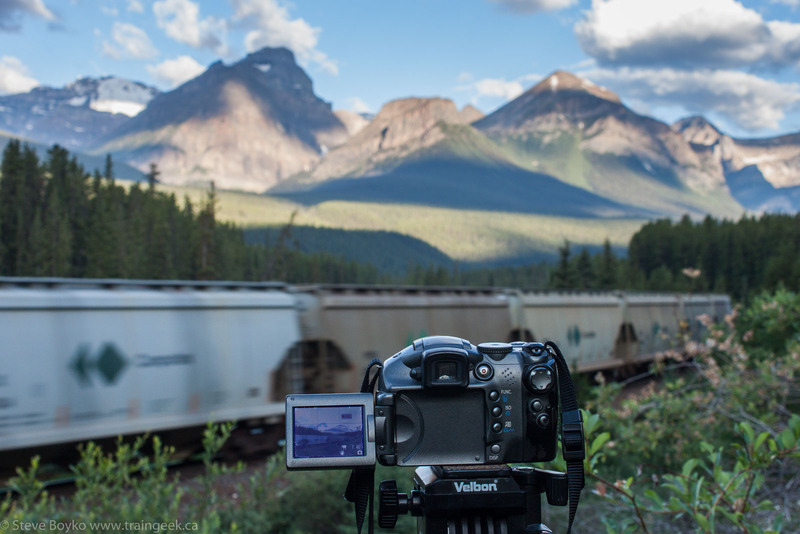 In fact, the Canadian Trackside Guide says it has an SW1200 for switching. I honestly just took one snap and carried on so I never saw the loco. There are no elevators in Treherne, although there certainly were some. They were gone by 2007. Note that CP has been threatening to abandon a portion of the Glenboro subdivision since 2006. The section between Rathwell and Page had no rail users. Later this was amended to Rathwell to Nesbitt. 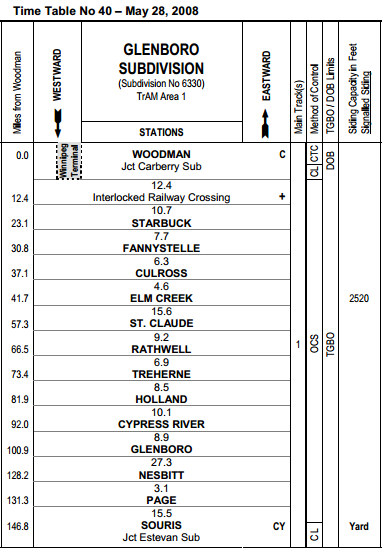 Surprisingly, in mid 2014 CP removed the Glenboro subdivision from their list of "to discontinue" lines. Back in 2010 I reported that the River Hills Railroad was looking at taking it over, but that's over and the RHR's web site is offline. Holland is next on the line. It has a lovely Paterson elevator. Holland is a nice little town. I love these murals showing their civic pride. Tammy Mahon was on Canada's national women's volleyball team from 2002 to 2012, and was the captain from 2008. She was also a star track and field athlete. Good for her and good for Holland for being proud of her. Holland even has a windmill. Next is Cypress River, featuring two elevators, both now Paterson elevators. While documenting these elevators, I came across this little fella. 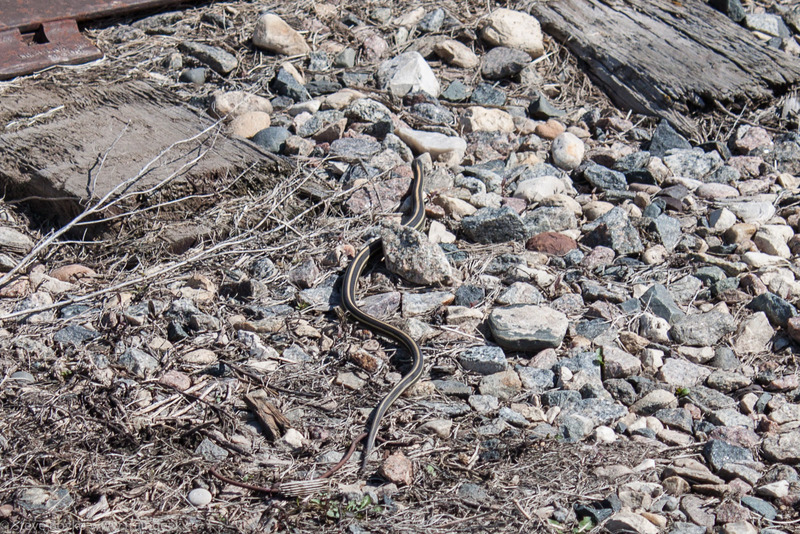 It was very much alive, but quite scared of me, and slithered away to do snake things. After Cypress River is Glenboro. There are no elevators there any more, sadly. Next is Nesbitt. 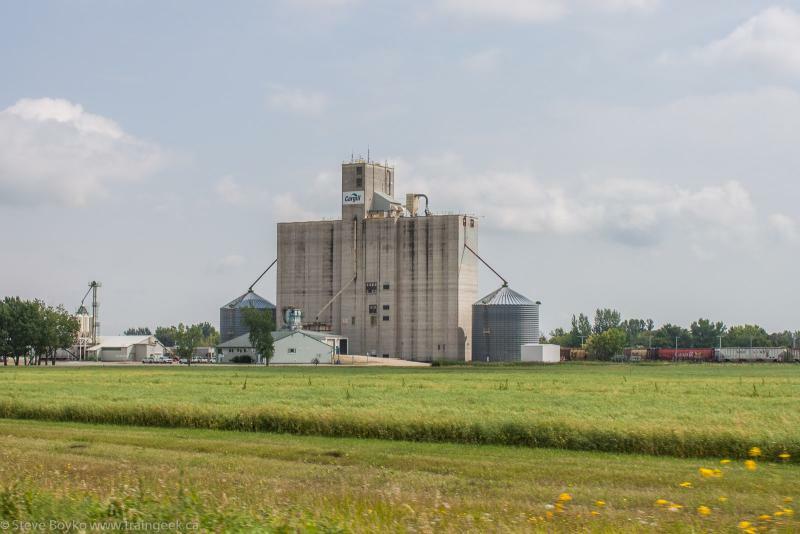 This town actually features two grain elevators. 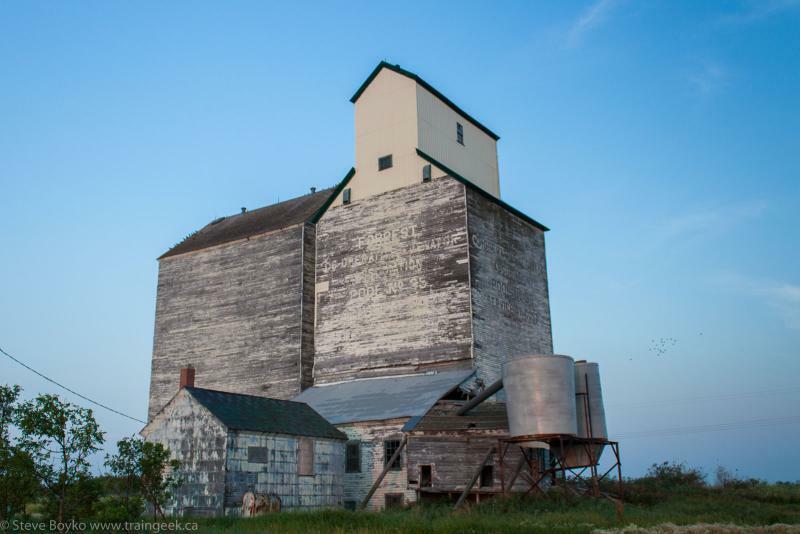 The first is the former Manitoba Pool grain elevator just east of town. 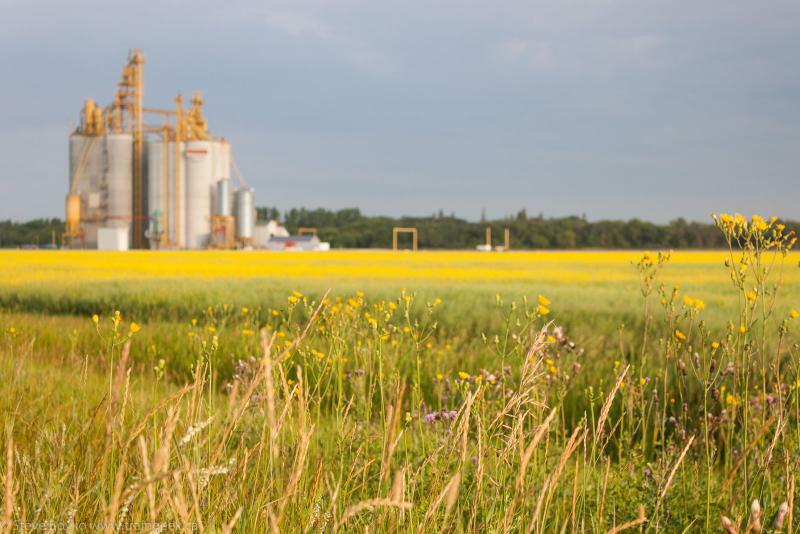 There is a large Cargill facility a few kilometres west of town. 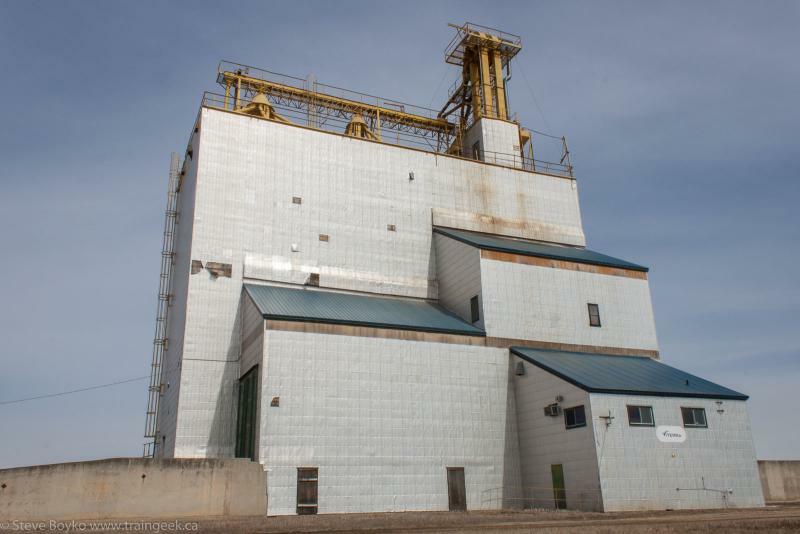 This facility has a capacity of 17,700 tonnes, and when I saw it, it was being served by CP! 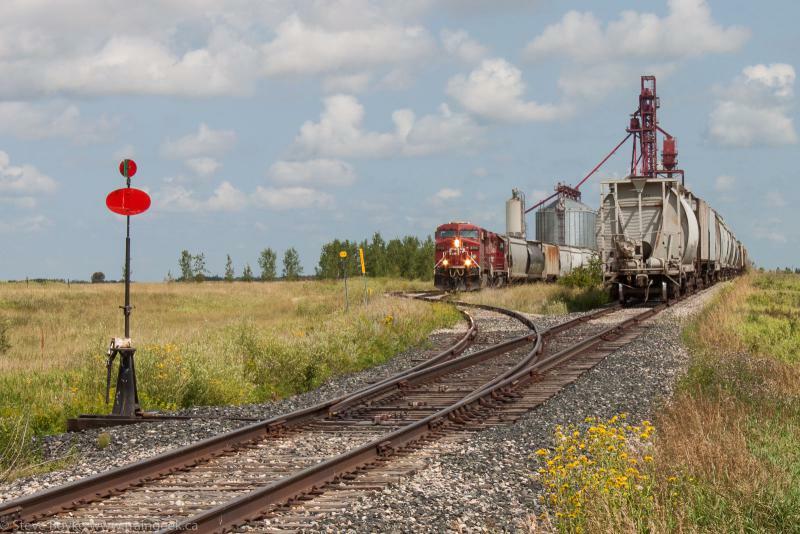 CP 8755 and CP 3079 were doing the honours. There was a crew van at the crossing I was at. I assume these guys were coming off shift when they were done switching. The next location on the CP Glenboro subdivision is Page, and it has no elevators. The western end of the Glenboro subdivision is at Souris, where it meets the CP Estevan subdivision. 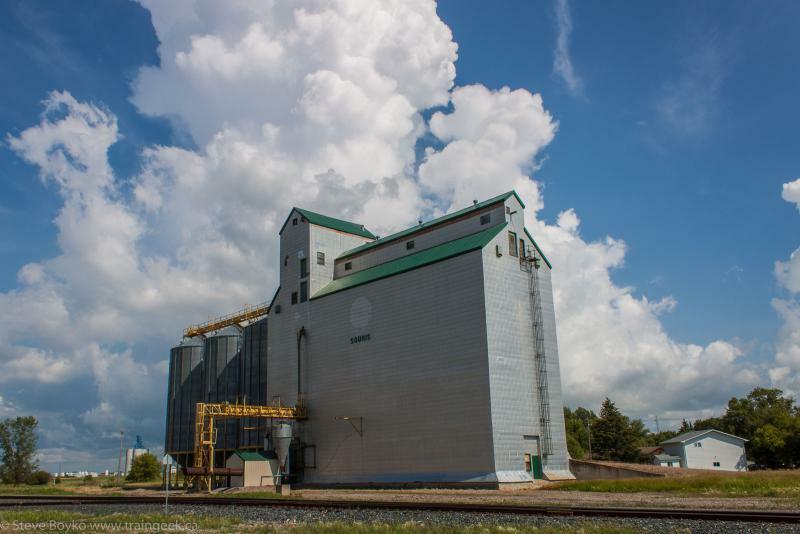 Souris is graced with two grain elevators. 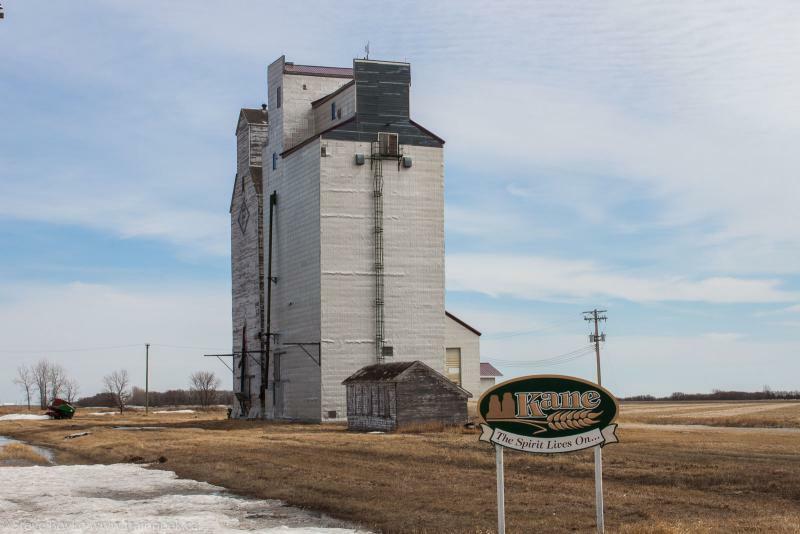 There's the former Manitoba Pool elevator, at the junction of the two subdivisions. 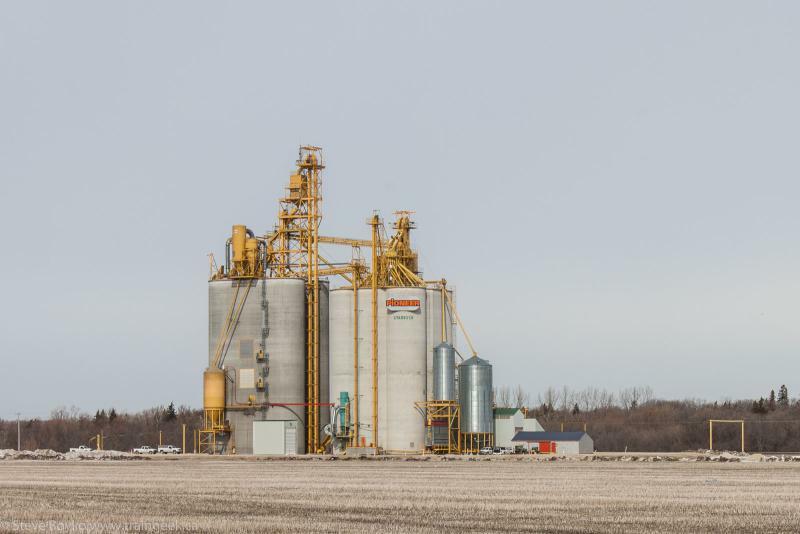 Just to the left of the elevator, you can see its replacement, the Viterra "Souris East" grain elevator. 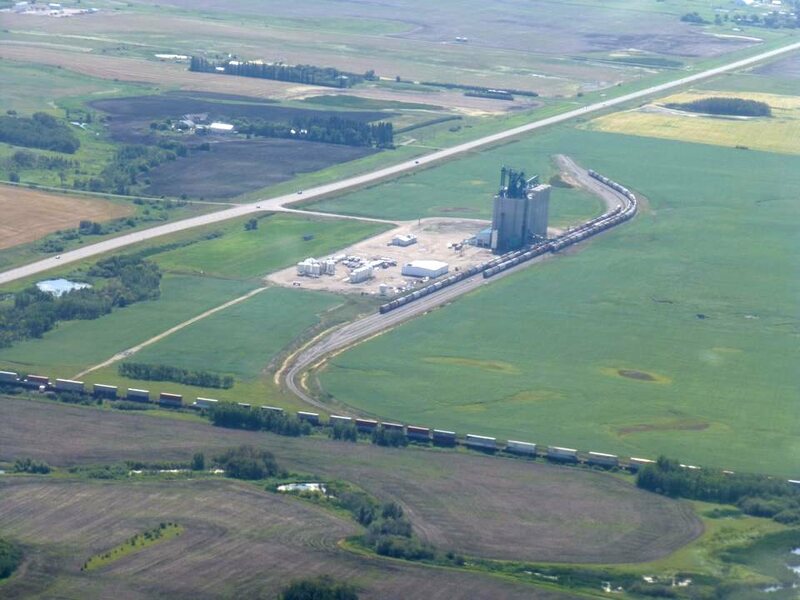 This Viterra facility has a LOT of storage tracks! 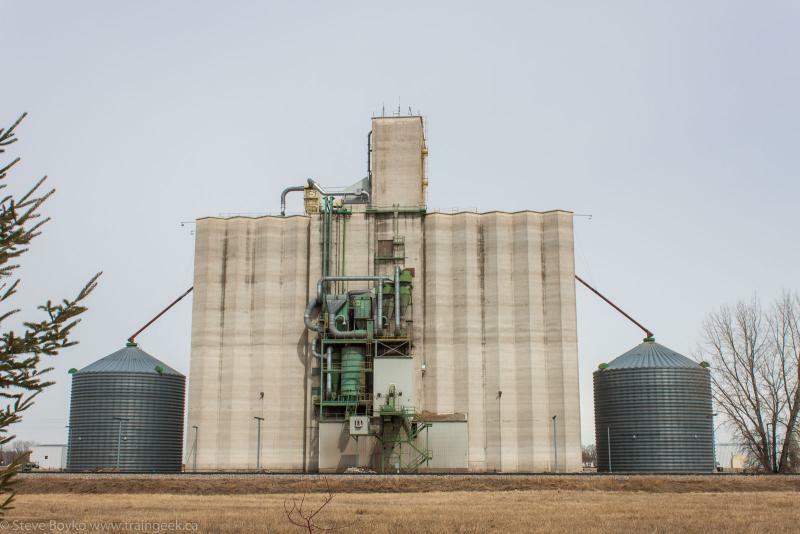 There you have it - the remaining grain elevators on the CP Glenboro subdivision. I hope you enjoyed the tour! Extra - If you are doing serious research, may I recommend the Mendeley program. It tracks your PDFs and research items and allows you to do searching, quoting, and annotation. 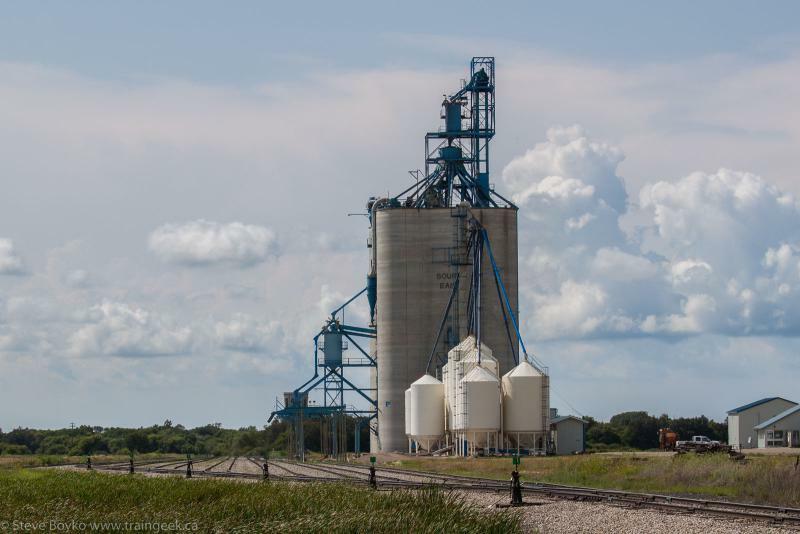 I use it for my grain elevator research and it is great at search. And it's free! 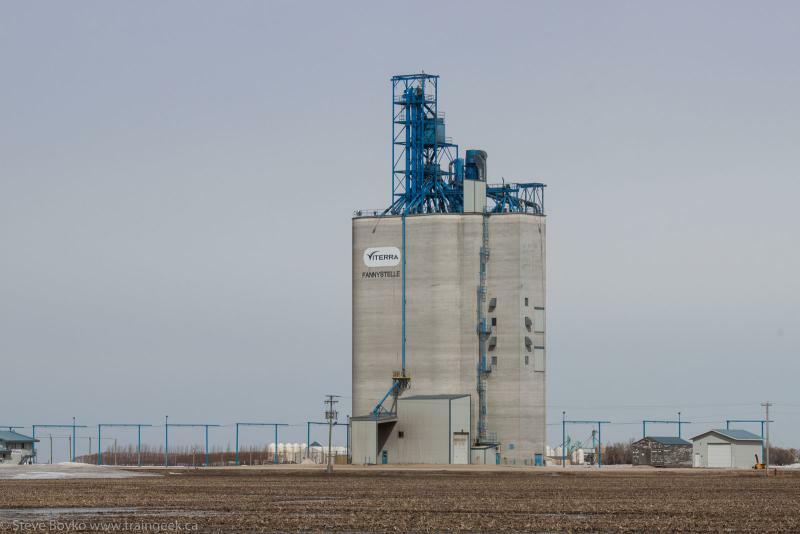 Extra extra - You might also like Elevators of the Carman Subdivision. 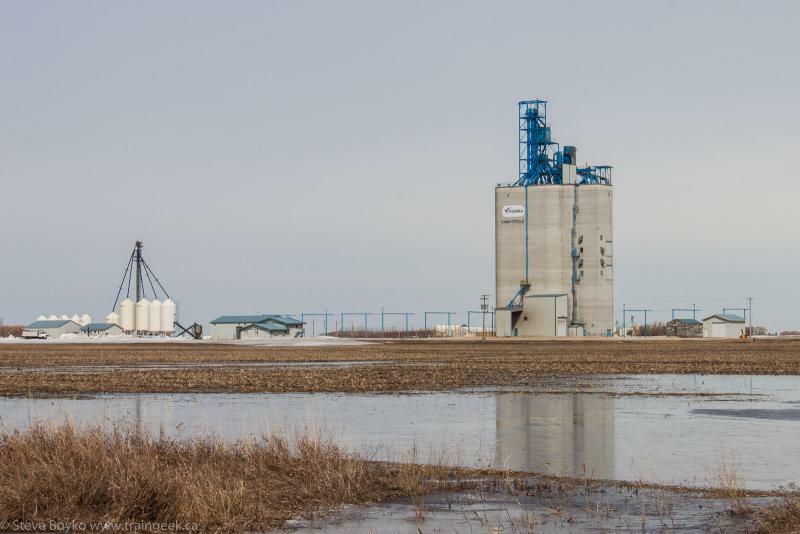 Recently Darren Mckay posted (on the RailsMBSK Facebook group) an aerial photo (that I believe he took) of the Viterra grain elevator at Knox, just north of Brandon, Manitoba. With his permission I am posting it here... slightly edited for contrast and saturation. We had a good discussion about the area and I thought I'd write a blog post about it. You see, if you look just a bit farther afield, there is a fair bit of rail history here. 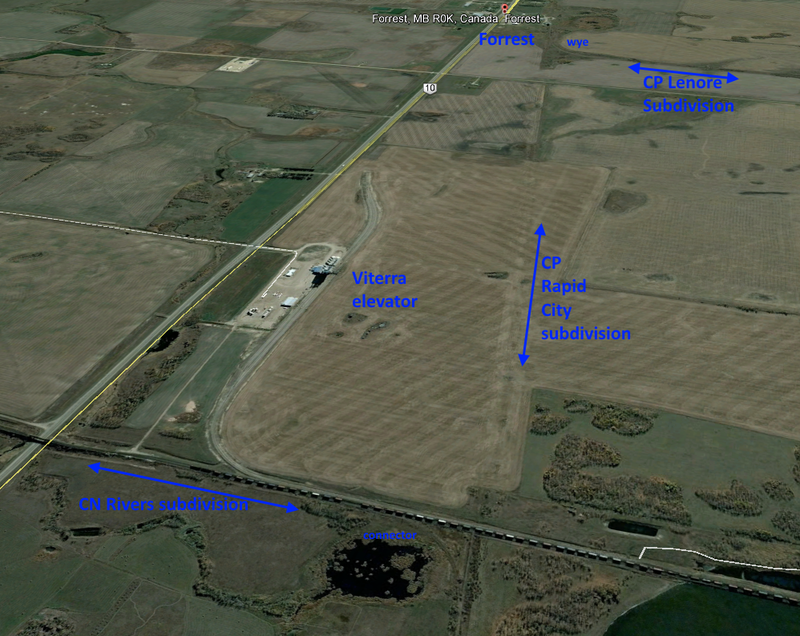 Here's a Google Earth screen capture that I annotated to show what was around here. There's the CN Rivers subdivision (originally the Grand Trunk Pacific) going across the bottom, but you'll notice I marked in two CP subdivisions that do not exist any more: the CP Rapid City subdivision that ran between Brandon and Minnedosa, and the CP Lenore subdivision that ran between Forrest and Lenore, MB. 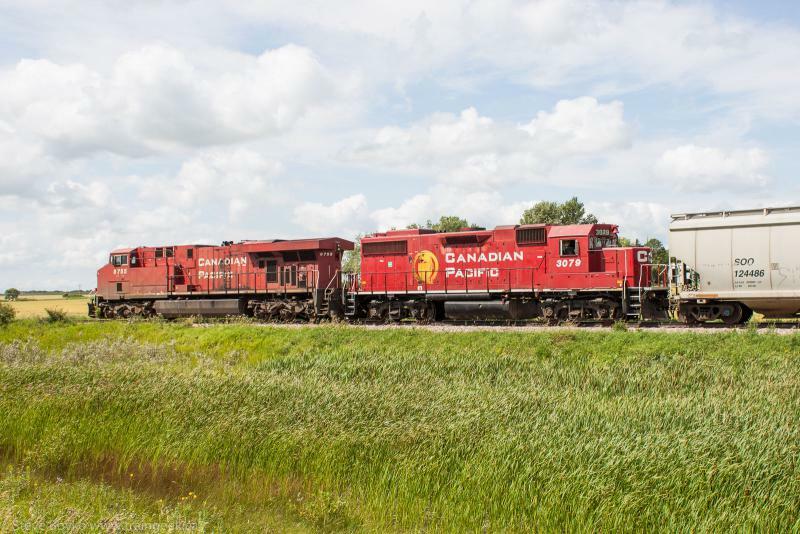 As I said, the original CP Rapid City subdivision ran from Brandon to Minnedosa, running generally north-south with a big side trip to Gauthier and Rapid City. Map courtesy of Brian Switzer. In 1963 the north portion was abandoned and the remainder was merged with the CP Miniota subdivision... which was abandoned in 1980. Anyway, back to the area in question. 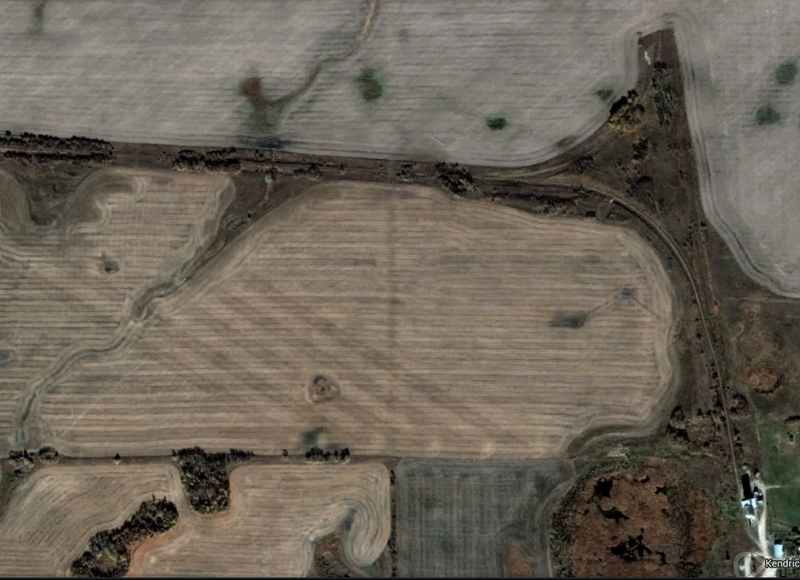 In the Google Earth image I showed, there are two interesting areas. 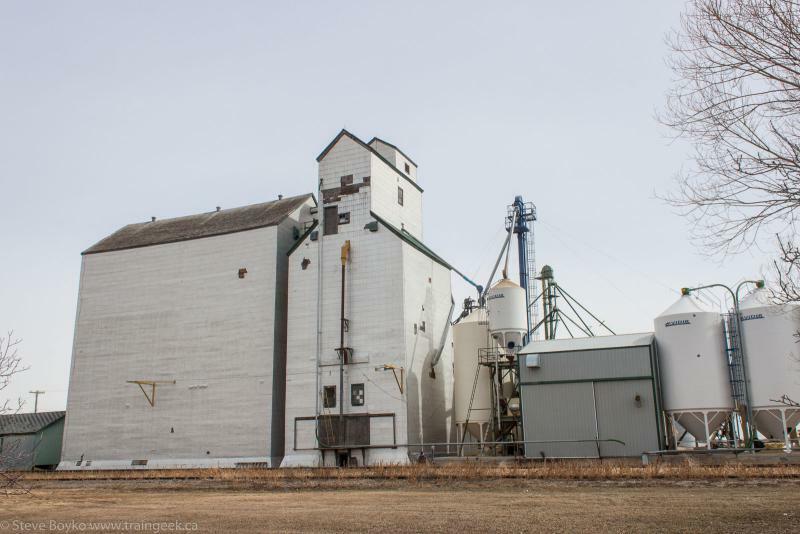 Forrest, Manitoba has a former Manitoba Pool grain elevator. It was also the start of the CP Lenore subdivision. 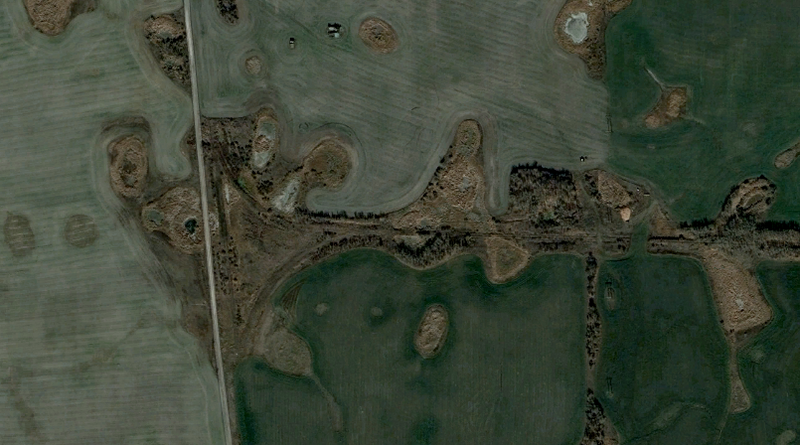 The wye that started the subdivision was just north of the elevator and is still visible from a satellite view (GPS: 49.971967, -99.941320). From the Forrest elevator, the rail corridor is still pretty visible. 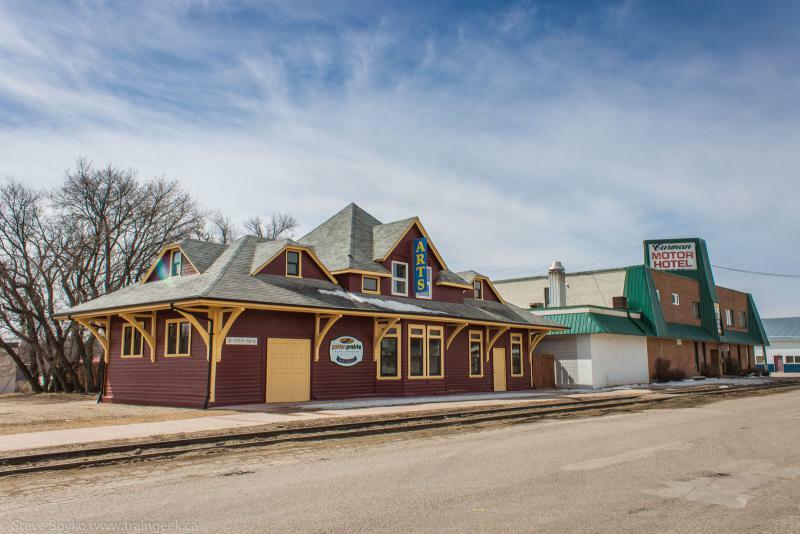 I'm told that CP used this connecting track to serve the North Brandon passenger station. 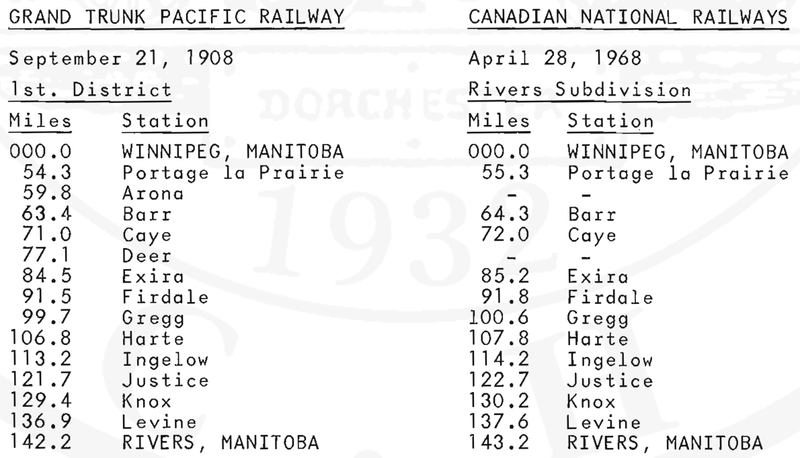 Oddly I can't find any reference to a CP North Brandon station in their timetables. 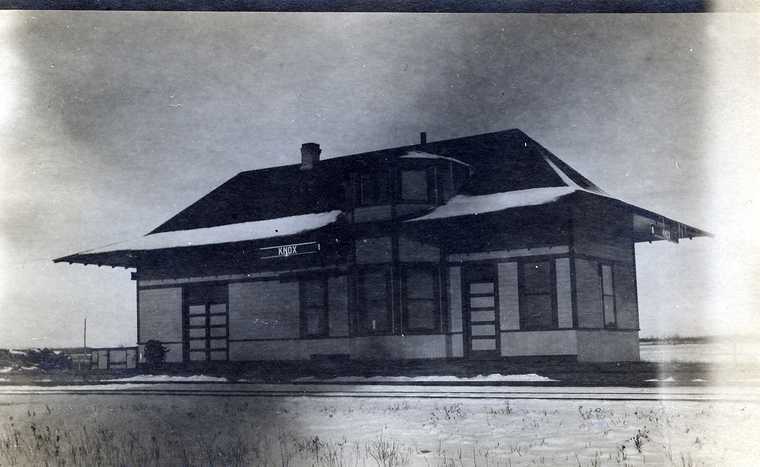 Knox was one of the Grand Trunk Pacific's alphabet railway stations. You may remember I recently posted about Justice, just up the line, and before that Gregg and Harte. A little quiz for the reader: why did the mileage change between the Grand Trunk Pacific timetable and the CNR timetable? 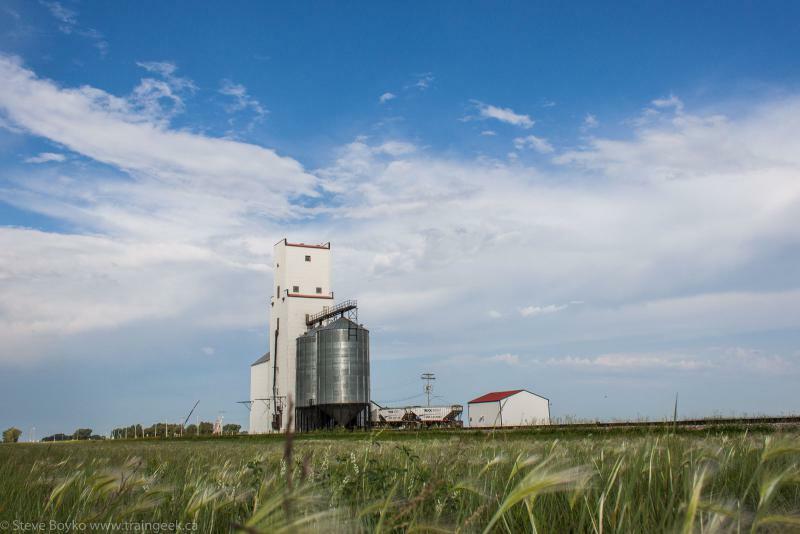 Continuing a few miles north on the CP Rapid City subdivision, you would encounter the start of the CP Varcoe subdivision, which ran from Varcoe to MacGregor and included the Brookdale and Oberon grain elevators. 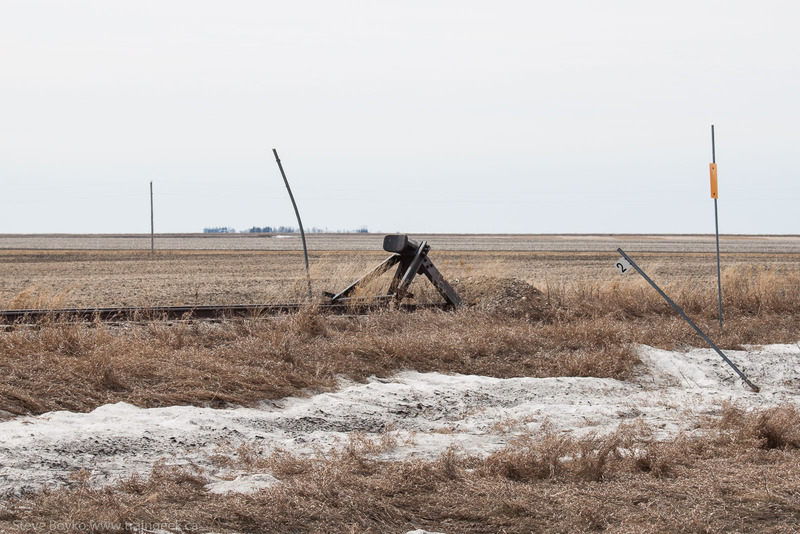 That line crossed the CN Rivers subdivision (at the east end) as well as the old CN Neepawa subdivision. 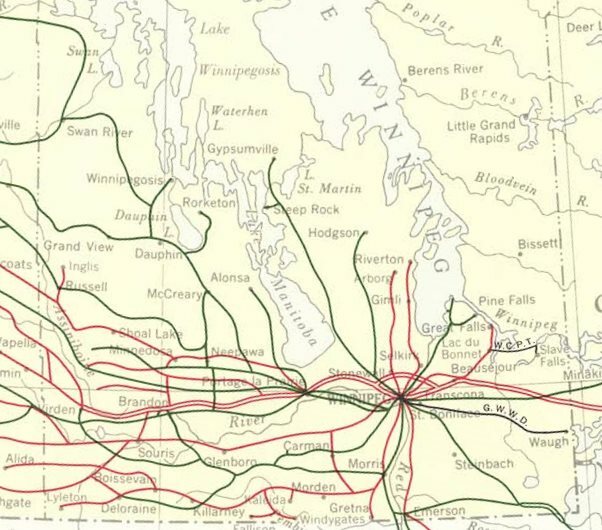 Do you ever get the feeling that railways in the Prairies were like a big bowl of spaghetti, like some 1960s Model Railroader track plan? 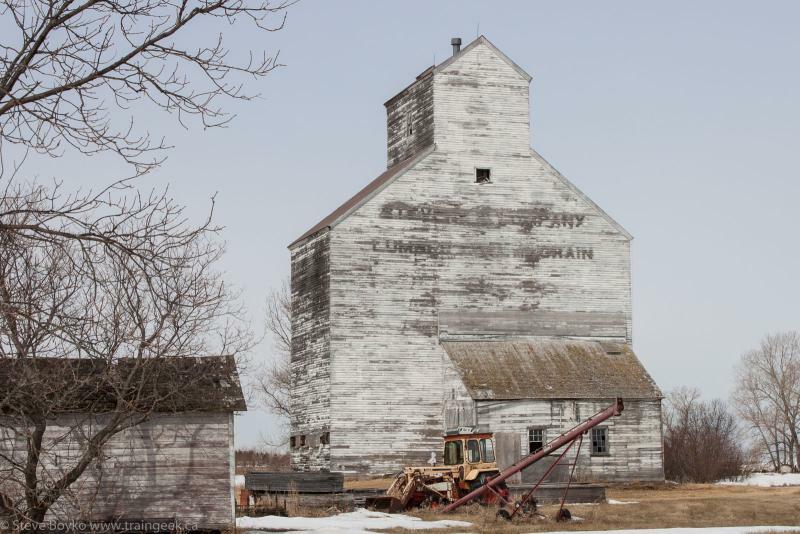 Back in April 2014 I went on a little "loop" to photograph some new-to-me grain elevators. I wrote about the first half here and now I'll complete the story. But first, I'll show you the route I took. 3 hours... plus picture taking time! I couldn't put Culross or Barnsley on there as Google Maps has a limit on the number of waypoints, alas. 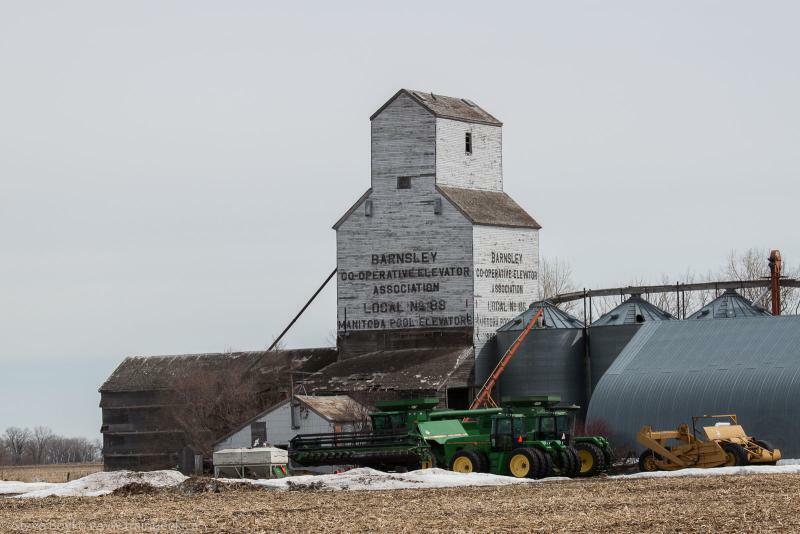 After we visited Graysville, we doubled back through Carman and headed down to the 23. 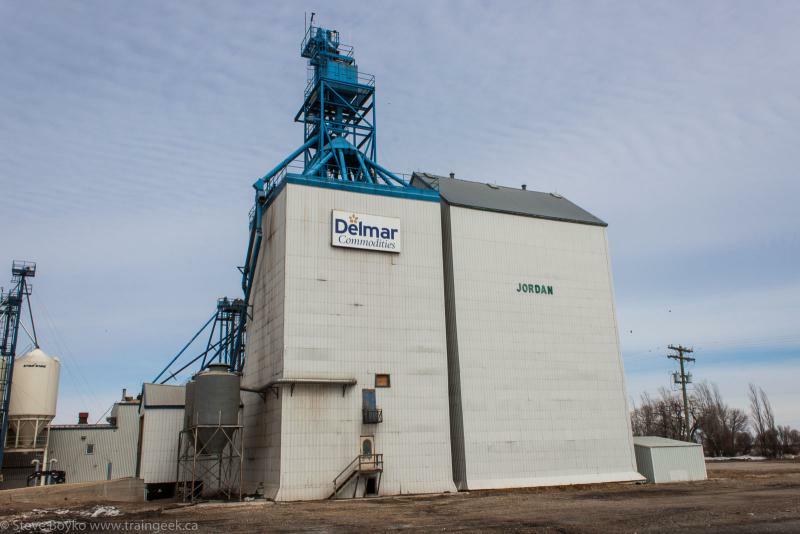 At the intersection of 3 and 23 stands the Jordan grain elevator. 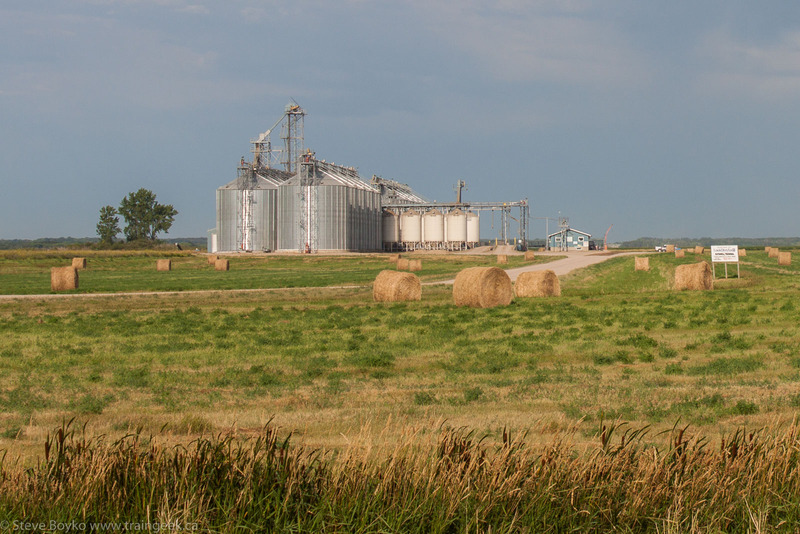 This is part of a Delmar Commodities complex including a soybean crushing facility. Highway 23 basically parallels the former CN Miami subdivision, and the roadbed was plainly visible in many places. 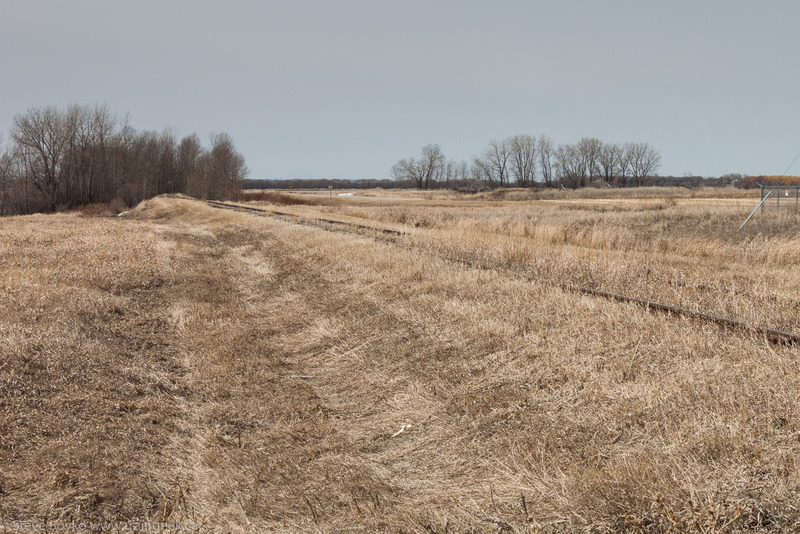 I guess it has only been about 7 years since the Southern Manitoba Railway abandoned it. 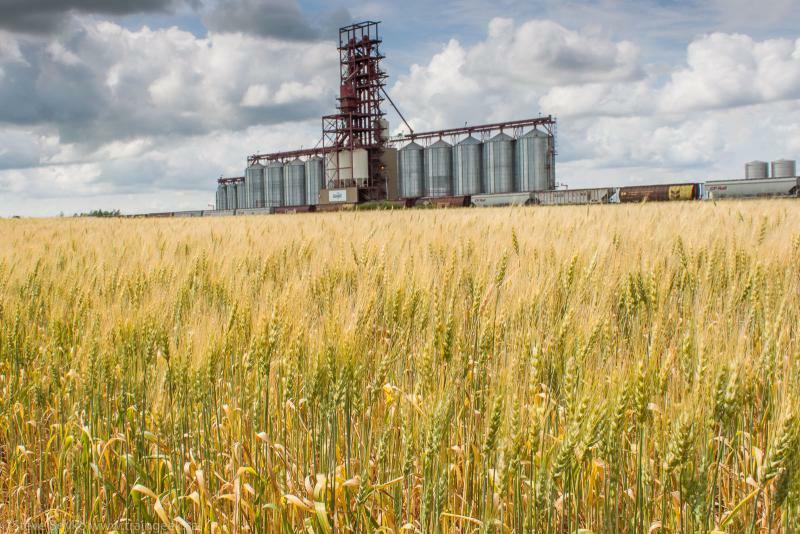 The next elevator was at Kane, Manitoba. 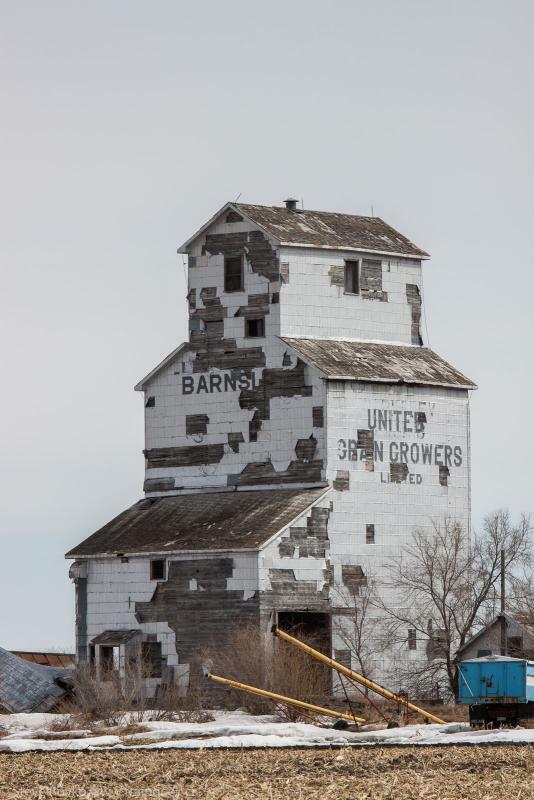 Kane had two grain elevators (Paterson and UGG) for quite some time. 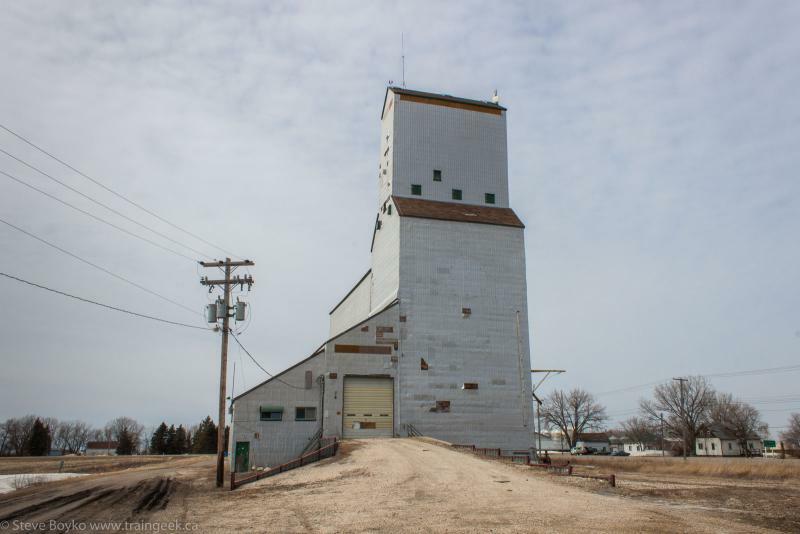 The UGG elevator was demolished in 1996. It looks like there are two elevators stuck together, and I guess in some ways that's true. 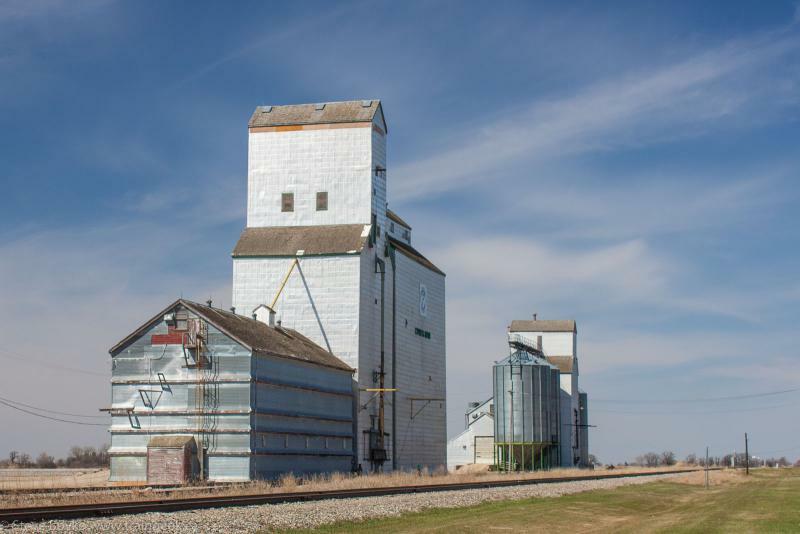 The more weathered elevator was built in 1947. 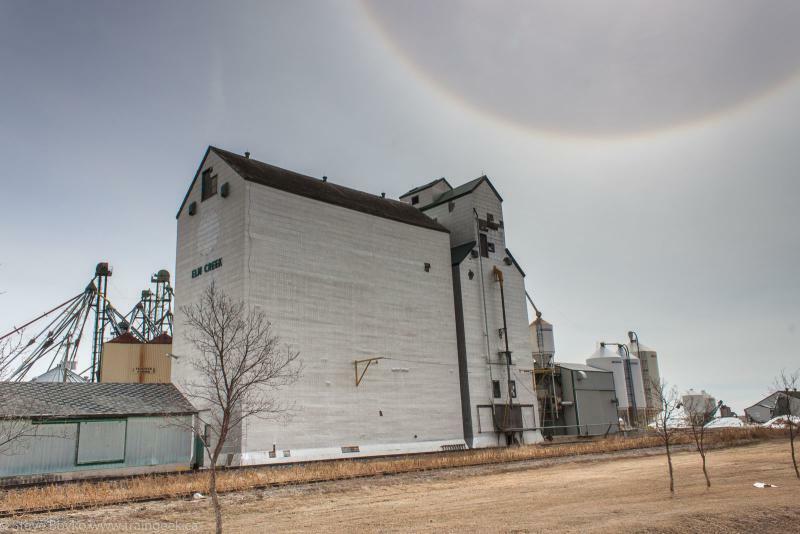 In 1981, major work was done and the silver portion was added, as the second-last wooden grain elevator to be built in Manitoba (Culross was the last). 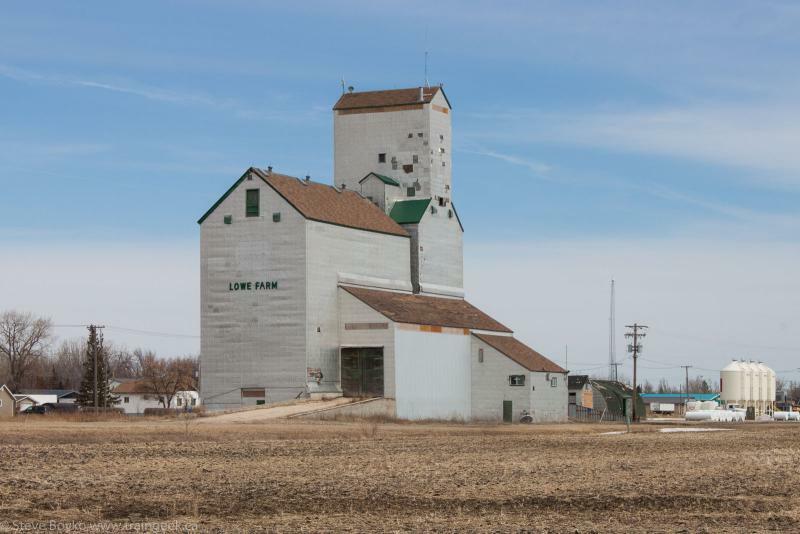 A few miles down the road is Lowe Farm. 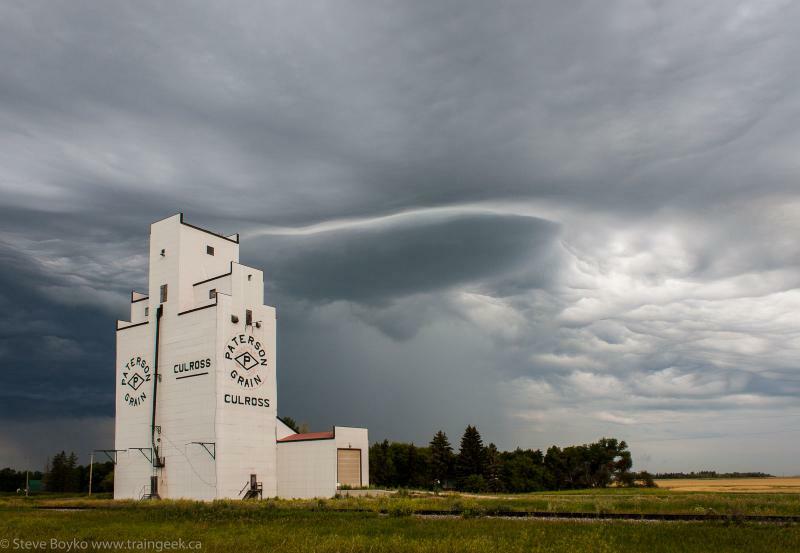 This is clearly a former Manitoba Pool grain elevator. After visited Lowe Farm, we carried on east to Morris (detail on Morris here). Here we found the current end of the CN Miami subdivision, such as it is. I was expecting just a pile of dirt! 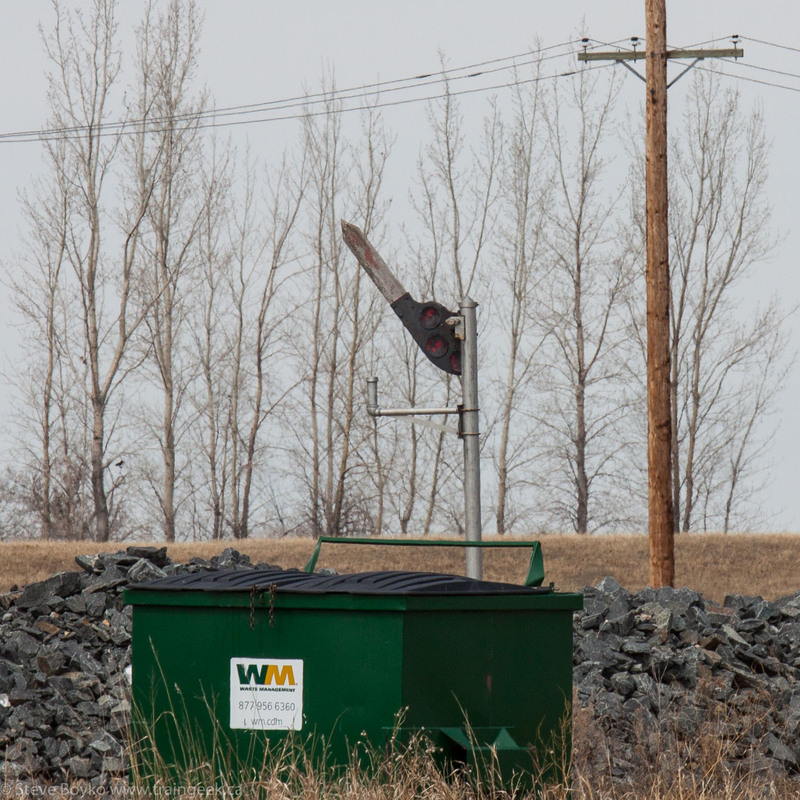 I also spotted another semaphore in Morris, this time on the north end of town on the CP side. Sorry for the poor composition but I couldn't figure out a way to get closer without trespassing.